Magic and music meet in this must-read novel. Set in the press of Mexico City, Signal to Noise splits its time between the present (of 2009) and the past (of 1989), both in the same small section of the city where Meche, the main character, grew up. And where after twenty years away she has come home to attend her father's funeral. It's a great set up, because there's a lingering tension and suspense that weaves throughout the story, the question of what happened that caused Meche to leave her home, to never see her father again, and to forsake her old life. It's a return in many ways, and one that the novel captures so powerfully. In 1989, Meche is an awkward teenager, experiencing the first tastes of the adult world. As something of an outcast, she seeks solace in music, something that links her to her father, who she idolizes. Her father is not a perfect man, though, often seeking escape through alcohol and entertaining fantasies about writing a book and doing something more with his life (and eventually stepping out on his wife and leaving the family). It doesn't make for the most tranquil of home lives, and so Meche is often out with her best friend, Sebastian. They are at the time when they are first getting interested in dating, and yet they look to the popular, pretty people in their grade as potential boyfriends and girlfriends instead of looking at what is painfully obvious to the readers. Not that they can't just be friends, but that they are interested in each other, jealous of the other's interests and afraid to act. It's part of what makes the novel something that can't be put down, the way it sets up the relationship between Meche and Sebastian. Friends, they seem paralyzed with fear that they will do something to ruin their current relationship, so they hesitate, so they look elsewhere for romance. Meanwhile the reader knows that something terrible is coming, that they don't talk for twenty years, that Meche seems to hate Sebastian in the present (though that is a lovely, complicated relationship that gets explored). And each incident, each argument and fight is a tease that asks "Is this when it happens? Is this the trigger?" And so I was glued to the book, unwilling to put it down. Add in Daniela, who is quieter, more caring, but has her own strength, and the central characters make the novel compelling and fun. Making the setting and the situation richer are the magical parts of the story, which entwine with the musical elements, making something personal to Meche and yet more universal to anyone who has been moved by music. The speculative elements don't dominate the story, but they do enhance it. Meche discovers that she can cast spells, that with the right music and with the help of her friends she can change things, can wield power. Not too much, but enough that she wants more. Enough that Meche begins to want to use her power to counter the injustices that she finds. She wants to fix her parents' marriage. She wants revenge for what people have done to her and her friends. And magic gives her that tool. Of course, as Meche's grandmother warns, there's always a price for magic, and it's one that Meche pays in full. Things spiral deeper and deeper until there seems to be no way forward for her, no way to navigate, and finally everything sort of erupts in her face. And then, in the present, twenty years later, Meche finally gets around to dealing with what happened. At turns tragic and celebratory, she manages to move forward, after a lifetime of standing still. It's an amazing, emotional ending that had me in tears. If you couldn't guess by now, this was not an incredibly action-packed novel. There are no real deaths shown, though death is a specter that hangs over the present of the book. There is violence but it's not dominant and that's not the point anyway. For people looking for a light read, this book might be a little dense (though it manages to be fun throughout). For people looking for the next action-adventure, maybe look elsewhere (though it has its moments). This book is about mood, about adolescence and adulthood, about growing up and accepting loss and a whole lot of other things. It's solid and intense and I could probably write like five different critical essays about it. But for now I will only strongly recommend it. 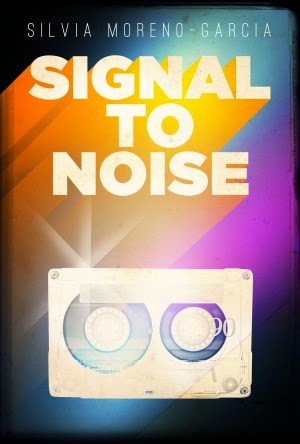 Signal to Noise is an amazing read. Bonuses: +1 for making me cry, +1 for magic and music and yes! Nerd Coefficient: 9/10 "very high quality/standout in its category(/seriously, read it)"